As part of the Animatronic Avian project, I need to have a way for the controller software/computer to send synchronized data out through all of the performers on the stage. Being that I may be using my reflashed stepper motor controllers in this, rather than full-blown Arduino boards (or custom ATmega boards), I need to have a way to network these without using any precious IO pins. On top of this, it needs to be very lightweight so that I can send data down through all of the performers without using too many resources of the device. I also want it to be cheap, both with cost of parts for implementation, as well as for system resources in the chip firmware. The solution I came up with is to use the builtin UART, which usually is set for a standard RS232 connection, but in a cascading daisy chain fashion. This means that the hardware-assisted UART in each chip, plus one data line down to the next chip is all that's needed to implement this. The networking stack running on the device is light enough that it should not impact performance of the main usage of the Arduino. Four wires are needed to hook up each node: power, ground, serial in, serial out. 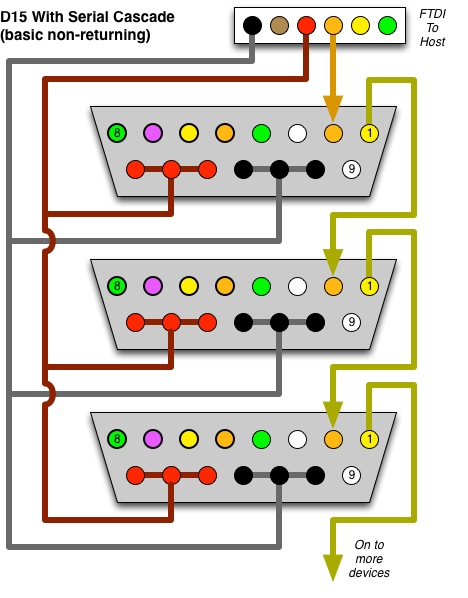 In the above configuration, the final node does not output to anything. I had the above working quite well with a simple firmware program. The program reads in a character from serial input, if it's a "b", it sends the "b" to the next device immediately, then turns off the LED for 1/4 second. If it is a number, it will turn off the LED for that many seconds, then subtracts one from that number and sends that new number down to the next node. So if it got a "6", it will turn off its LED for 6 seconds, then sends a "5" to the next one. This was the simplest program I could think of to check if this concept would even work. Turns out, it does! So the basic idea of how this will be used is as follows. It now sends this modified data envelope to the next device on the bus. That device will pull off the five "200"s from the end, and then send down the new envelope. The final micro on the list will pull off the five "1"s, the count reduces to 0, and it refrains from sending anything further. The specifics of the protocol are yet to be worked out. The latency of this will be imperceptible for the use cases I plan to use this for, and it will enable me to have oodles of devices on the serial bus, all controlled by one host computer. And best of all, no additional hardware (MIDI, DMX, I2C, SPI) is required, and no additional IO pins will be used for it. ** It is then decremented then sent out. ** Boring on its own, but it's a test to see if I can cascade RS232 devices. // read in a character. // If it's within '1' .. '9', set the timer for that number of seconds. This is interesting but I am wondering why would you do this instead of I2C and the Wire library? I would think I2C would be more efficient because devices don't have to 'pass on' messages, they just only pay attention to messages which are addressed to themselves. Is it that this gives a longer range? A few reasons: 1, I2C would require the use of two additional lines, and on these widgets, i'm already pressed for pin usage... it would have to be software based as the I2C lines are not broken out to any headers at all. On top of that, the additional use of the library would use resources as well. On top of that, each device would have to be specifically programmed with an ID for it to listen to. I'd rather have their ids be defined just as their physical connection to the linear network. Also, the devices will be placed along a 50-100' connection range, and I'm not sure that I2C would support that. Not to mention of course that special hardware would be required to work on debugging it if i need to see what the controller is sending out. using serial, i can just hook up a terminal (with standard ttl-RS232 voltage level converter)and i can see exactly what's going out. This is an interesting idea. You are correct that i2c doesn't support the cable length you are proposing (10' is about the limit without external drivers). However, neither does RS232 (limited to about 50') without special handling. Even with that, I don't know that the signals on the TX/RX pins (which are not RS-232 level) would even go that far. As far as sacrificing pins, both the UART and the i2c use the same number of pins (2). The are different pins, TX/RX vs. SCL/SDA, but it is 2 pins in either case so that's not really an issue. And each device doesn't necessarily need to be programmed with an ID, there are other ways to deal with that problem that don't require repeating the message over and over down the line. You mention that this is fast enough for your application. That may be the case, but this method might not be fast enough in another setting. I also question whether it is truly fast enough when you scale to the size your project proposes. Think about the traffic when you have, say, 100 units on the buss. Assuming your suggested protocol of 5 bytes per node, the host has to transmit 500 bytes. If you were on a shared bus like i2c that would be the end of it. With your setup, the first node then has to send 495 bytes, then the second node has to send 490 bytes, and so on. In the end, you must send 25250 bytes total. Assuming you have 100% efficient reflection between nodes (no delay between receiving the packet and starting to retransmit it) at, say, 9600 baud, 8 data, 1 stop, no parity, that translates to about 26 seconds (25250 bytes / 960 bytes per second). You could mitigate this by starting to retransmit the packet as soon as you have the first few bytes in (enough to calculate the new length). That way, you would only add 100 to 200 byte times to your total time because of all the parallel processing. Still, your 500 byte packet will take something like 3/4 of a second to work its way down the line. And, you are still asking all your nodes to do a lot of extra work. On average, each node is transmitting 1/2 the data. In our example, that would be about 250 bytes. And, this is not evenly distributed since the first node always has to transmit the entire packet and the last node has to transmit nothing. Understood. I plan on having no more than probably 6 nodes on the network. And on top of that, even if i get 50' per run, that's more than plenty, since I plan on needing no more than 50' total. Each node will act as a repeater, so really, no length will be longer than about 10' apart from either neighbor. 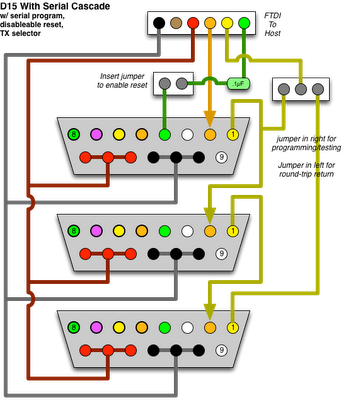 Personally, I would have used a star topology ( connect all arduino TX's together and then to the FTDI RX , and all arduino RX's together and then to the FTDI TX). As for making these devices "configuration free", I would have an initialization script that runs on the server , which when it's run emits a "next available ID" packet, and when a device is powered up, it listens for this packet type, and responds to it with a "device ID taken", and then write the data into it's built-in EEPROM ( just one byte will do 255 devices)... the initialization script just increments the ID number it announces, each time it sees a "device id taken" packet. In this way, you initialize devices by the order that you turn them on, and they remember that order till you change it by running the server-side script again. The upside of this arrangement is that there's no "retransmit" latencies, there's a simple ID based packet protocol ( ie , each note ignores packets with an ID that doesn't match ), and it still only needs two lines to communicate with the PC and each arduino. You need to be a little bit careful that only one Arduino "talks" at a time, but if your protocol is made so that the "master" PC always communicates first, and the device it's communicating with has only a fixed time to respond afterwards, then thee contention is easy to manage. Also, remember to use tri-state logic on your arduino TX pins when they are not actively TX-ing, otherwise you'll mess up TX from the other asrduino/s. Buzz: By chance, have you ever successfully implemented a Serial Star Topology like you describe, or is it just theory. If the Star actually works, it would make a design I'm working on much much easier. Go with RS485 at a normal 9600 baud rate: no daisy chain but parallel connected slave nodes on a single line is the way to go (DMX anyone?). Still you would need to address them but c'mon it's a lot easier and faster to program "snif for your address" than "repeat the whole stream of data while you search for your part"
Burning the address on the eeprom is not that hard and doesn't require IO pins, just the usb programming in case of arduinos. Also that way you make sure that the remote controlled flame thrower doesn't shoot because you connected the terminal cables in the wrong order. As a bonus everything works directly from +5V, can connect everything with the cheapest ugliest twisted pair you can find and still get range, also the RS485 converter chip (SN75176) cost something like ten cents each. I do not believe that it will. I have further to post about this. I have made each Arduino-node into its own module with FTDI header for input, and a FTDI header for output. For testing, they're just plugged into each other, with a "reflector" on the end to send the last node's info back to the host. It all works REALLY well. 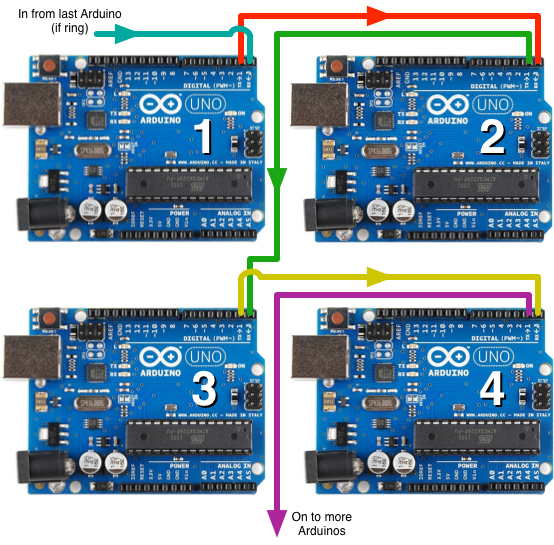 For accuracy, the above picture of the Arduino UNOs is probably not realistic. I will probably recreate the image for the followup post using Sparkfun's Arduino Pro, which has FTDI header on it, and does not have hardware sitting on D0 and D1, which I am not positive would influence the serial connection or not. It is a very good question though. I should probably experiment and get you a definitive answer. How well did it work out in your family room? And if you were directly connecting the UARTs (without any electrical buffering or conversion), how far apart were the devices? Did you use twisted or shielded cables? You just made me save several $, as I was about to buy 50 MEGA 2560 arduinos (hosting 3 UART each) as I though I needed two serial ports on each device to acheive the daisy chain communication. Hey there, thanks for the run down. I read a lot of comments here, and see that you were as recently as July still working with arduino boards, so I have to ask. ...Did this work? Your proof of concept shows that it should, but did it do what you wanted? I want to daisy chain 3 or 4 arduino nanos to record data on a Pi Zero. Each of the arduino will control a specific electronic function on an electric motorcycle, and I really want each to pass off their pertinent output (eg: the throttle controller should pass along strings of CSV of throttle input, throttle output, and throttle mode). Because I want to transmit ASCII strings, I'm transferring a good deal more data than you were. 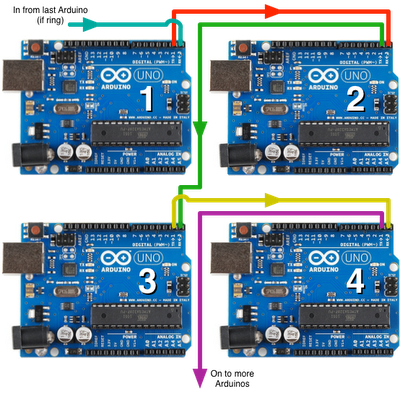 Each arduino can just append their data to the end of the string they received and pass it on, the Pi will append the full string into a CSV single file, each line a new data point with several values, then upload its database to a home server when trusted wifi is connected. Essentially the bike should output a spreadsheet of its own dynamometer!